A protester holds aloft a banner calling for freedom of speech near the headquarters of Southern Weekly newspaper in Guangzhou, Guangdong province on Monday. GUANGZHOU, China — Scores of supporters of one of China's most liberal newspapers demonstrated outside its headquarters on Monday in a rare protest against censorship, backing an unusual strike by journalists against interference by the provincial propaganda chief. 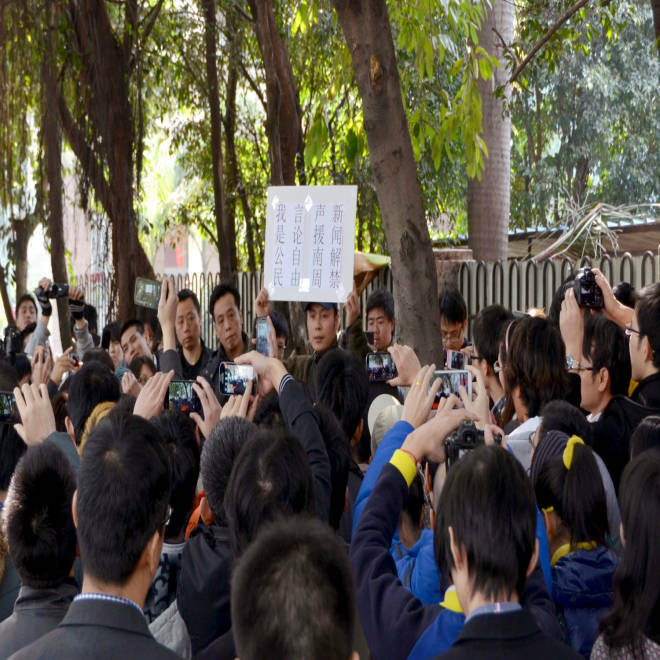 Police allowed the demonstration outside the headquarters of the Southern Group, illustrating that the Guangdong government, led by new appointee and rising political star Hu Chunhua, wants to tread carefully to contain rising public anger over censorship. The protesters, most of them young, laid down small handwritten signs that said "freedom of expression is not a crime" and "Chinese people want freedom." Many clutched yellow chrysanthemums, symbolizing mourning the death of press freedom. "The Nanfang (Southern) Media Group is relatively willing to speak the truth in China, so we need to stand up for its courage and support it now," Ao Jiayang, a young NGO worker with bright orange dyed hair, told Reuters. 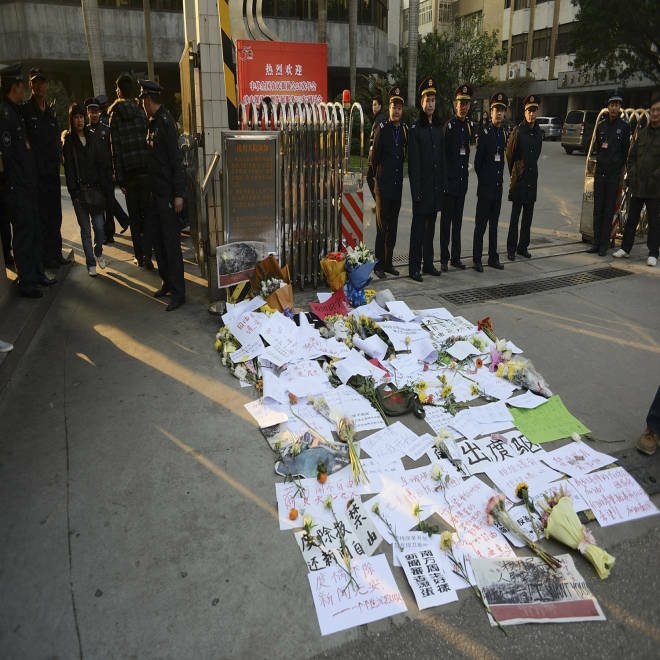 Security guards stand near protest banners as flowers are laid outside the headquarters of Southern Weekly newspaper in Guangzhou, Guangdong on Monday. The U.S. State Department on Monday weighed in on the popular agitation for freer speech in China. "We believe that censorship of the media is incompatible with China’s aspirations to build a modern information-based economy and society," said spokeswoman Victoria Nuland, speaking to reporters at the daily department briefing. "It is, of course, interesting that we now have Chinese who are strongly taking up their right for free speech, and we hope the government’s taking notice." Chen Ziming, a Beijing-based political analyst who spent years in prison for his involvement in the 1989 Tiananmen pro-democracy movement, said the protests could get worse if authorities ignore the protesters demands. "I am concerned … that the leaders concerned may not have the boldness and the capability to push for more reform," he told NBC News. "If the problem is not handled properly, there is the danger that it will expand and worsen." The non-profit watchdog group Reporters without Borders ranked China at 174th out of 179 spots in its 2011-2012 press freedom index. The United States ranked 47th in the annual report, six rungs above Hong Kong, a former British colony which is administered separately from China's mainland. "China, which has more journalists, bloggers and cyber-dissidents in prison than any other country, stepped up its censorship and propaganda in 2011 and tightened its control of the Internet, particularly the blogosphere," the group said in a report about the rankings. The attention paid to the protest domestically highlights the unique position of Guangdong, China's wealthiest and most liberal province and the birthplace of the country's "reform and opening up" program. In a symbolic move, Xi chose to go to Guangdong on his first trip after being anointed party chief in November. "That this is happening in Guangdong, a trendsetter of China’s reform, is cause for worry," Bao Tong, the highest ranking party official sent to prison for sympathizing with the 1989 pro-democracy movement, told NBC News. "If Guangdong regresses, then it will be a setback for the reform pioneered by Xi Zhongxun," he said, referring to the father of new Party chief Xi Jinping who was once Guangdong’s governor. Talking to NBC News by telephone from his Beijing home where he remains under virtual house arrest, Bao said China’s new leaders recently called for protecting the constitution and rule of law. "What the journalists did was to support the call of the new leaders, and the leaders should be happy, not unhappy," he said. Several open letters have circulated on the Internet calling for the Guangdong propaganda chief, Tuo Zhen, to step down, blaming him for muzzling the press. Photographs on microblogs showed banners that said "if the toxin of Tuo isn't removed ... Guangdong will be castrated." "Not since the time of reform and opening up and the founding of China has there been someone like Tuo Zhen," Yan Lieshan, a retired veteran editor at the Southern Weekly newspaper, told Reuters by telephone. "He's too arrogant. He has gone overboard and constantly violates regulations." Xiao Shu, a former prominent commentator at the Southern Weekly, said Tuo required that journalists submit topics for him to approve and that he yanked issues that he disliked. "These details illustrate one problem: that he has established within the Guangdong media a system of prior censorship of the press," Xiao said, calling for Tuo's removal. Chinese Internet users already cope with extensive censorship, especially over politically sensitive topics like human rights and elite politics, and popular foreign sites Facebook, Twitter and Google-owned YouTube are blocked. China shut the website of a leading pro-reform magazine on Friday, apparently because it ran an article calling for political reform and constitutional government, sensitive topics for the party which brooks no dissent. NBC News' Eric Baculinao, Le Li, Kari Huus and Reuters contributed to this report. ANALYSIS: Is peace really in the air in Afghanistan?